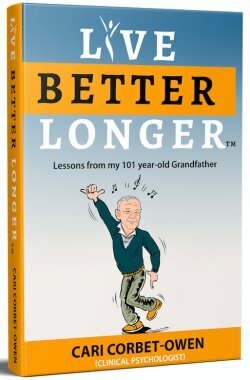 Centenarians - those people who live to 100 - don’t spend much time fussing and bothering about whether they like their body or body image positive. For many of them, their body is less an item of beauty than it is of function. They need their bodies to be strong rather than have a particular shape or measurement. We assume that body image positive is the automatic result of being thin, but if that were the case, models and other thin icons would have a good body image and self esteem and live to over 100. They'd be well-balanced, psychologically healthy and secure people...and most aren't! Frankly you get thin people with a negative body image and fat people who love themselves. It's not whether you're thin or fat that makes the difference, it's whether you feel you deserve to be loved regardless because that creates health and ageless living. About 2/3 of our overall self-image is made up of our body image. But current research shows that only 2% of women are satisfied with their bodies. How sad that we've been hoodwinked into feeling so insecure! 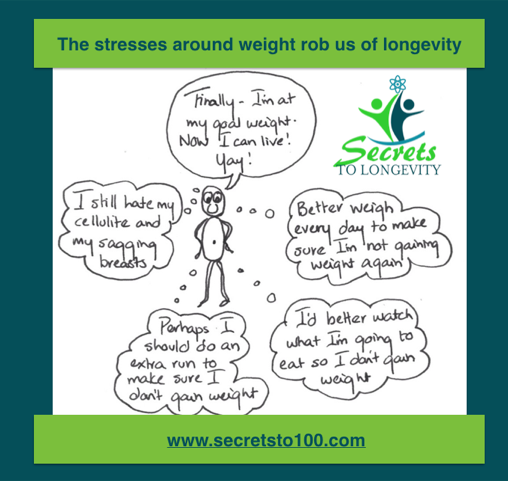 Insecurity is stressful and stress robs us of achieving health and longevity, so that goes to say that anything that reduces our health also makes our chances of living to 100 less likely. "I had my "young and hot" phase, and I was miserable. Not just because I was in the thrall of the no-win beauty contest culture, but because for me it was a mix of being embarrassingly worshiped and insanely hated. Men were admiring one minute and MEAN the next. Women were jealous or condescending. I felt like prey most of the time, and was horribly insecure. Now, in my 50s with 40 extra pounds on me, I like myself more than I ever have for the person I am." It just goes to show that a healthy body image and graceful aging starts in the mind and NOT in the body. Only that's not always true. We might have a temporary lift but like many dieters you may find you get there only to find you're still not satisfied. And if you're a repeat dieter you'll know that happiness at seeing that number on the scale comes with a whole new set of fears. You'll know that having a healthy body image and demands more than just thinness. Frankly, for each pound of weight you lose, you need to gain a pound of self-esteem because that's what it takes to have a magical mind and a magical body. The reason we want a good body image is because we want to be happy and live well but is how you feel about your body helping your better total health or is your dislike of self and the biology that accompanies that, taking you even further away from a healthy mind healthy body? And here's what lies at the crux of a desire to lose weight: What we're really looking for is the happiness and contentment that losing weight is apparently going to bring us. The problem though is it that many people think that moulding their body into what society says is an acceptable and healthy body image will gain them entry into Happyland - only to find their apparent flaws and imperfections never quite seem to go away. So prevalent is that body critic that researchers have coined a term for it - it's called 'normative discontent.' In other words you're the abnormal one if you like your body! That's pretty alarming if you think that we were all born with a body image that was positive! But when we place our emphasis on attaining a healthy mind (rather than focusing on weight loss itself or body image positive), and ageless living, even without any weight loss our lives and healthy body image improve dramatically. 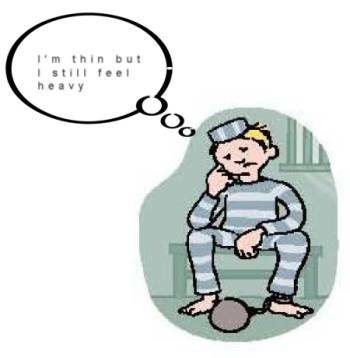 That's precisely why I named the MIND over Fatter program what I did - it's not your body that's the issue, it's that you have a fat mind-one that is focussed on things that make you unhappy. Having a healthy longevity lifestyle based on the power of love (self-love) is more important. And that's why part of my vision for creating this website is that it has a holistic approach which incorporates a healthy body image and good self esteem as being absolutely central to our happiness and our longevity. The biology of our thoughts is all powerful. I've seen fat people (like Virgie Tovar, Ragen Chasten, Marilyn Wann, Jess Baker and more) who believe your opinion of them is none of their business - applause and drumroll please. It takes a strong-minded person to thumb their nose at our thin-privileged, fat-phobic and frankly downright stigmatizing world. They have held onto a healthy body image and the health-enhancing biology that goes along with that, despite all the odds. I love this quote from Karen Koenig in Overcoming Overeating: "If the scale gives you bad news, it's telling you you're unacceptable today. If the scale gives you good news, it's telling you you were unacceptable yesterday..." It's like you can never win. Thomas Cash: The Body Image Workbook.